The Analysis and Validation Perspective allows users to perform analysis, fitting, model comparison, and validation across multiple simulations and data sets. The Analysis perspective uses data from either complete simulation runs or data imported into STEM. The latter could be real bio-surveillance data in the appropriate CSV format or data from a completed simulation. By default the Analysis perspective contains three views. However you can close any of these views and open others. 1. Estimating Model Parameters from External Data. 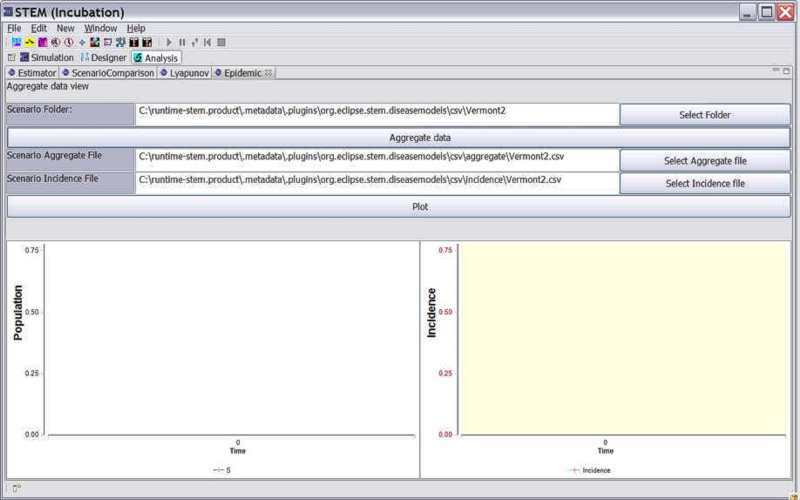 This view is used to estimate model parameters from an existing data set (simulated or real). 2. The Epidemic View Aggregates data across locations for a given epidemic scenario and plots the aggregated data and disease incidence. 3. RMS Comparison between data sets Measures the RMS difference between two existing data sets (simulated or real). 4. Lyapunov Analysis Comparison of data from two existing scenarios (or real data sets) based on their trajectories in a Lyapunov Phase Space. As shown in the figure below, each type of analysis is available as a separate "View" or tabbed pane within the Analysis Perspective. This page was last modified 16:05, 26 January 2012 by Judy Douglas. Based on work by James Kaufman and Judith Douglas, Eclipsepedia user Edlund.almaden.ibm.com and others.